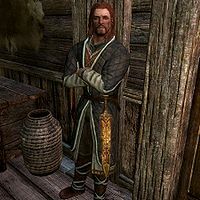 Brynjolf is a Nord thief, and a member of the Thieves Guild in Riften. He is initially found at a market stall in the center of Riften selling mysterious red elixirs, although he will usually approach you and inform you that he knows you didn't make all of your money legally (or if you don't have much gold on you, will offer you a way to make some). He has a rivalry with fellow merchant Madesi, who doubts Brynjolf's potions are real. Brynjolf will task you with stealing Madesi's ring as an initiation for joining the Thieves Guild. Once you join the Guild, he will move to the guild hall in Riften's Ratway. Brynjolf will later become a temporary follower, along with Karliah, when hunting for Mercer Frey during the Thieves Guild quest Blindsighted. Brynjolf wears fine boots, fine clothes, and an Amulet of Articulation, and he carries two daggers and some gold. Detecting an enemy "Come out and face me, you coward!" "I can smell your fear." Spotting an enemy "Finally! Let's end this." "There you are!" Taunting an enemy "My blade thirsts for your blood!" "Come on. Show me you've got what it takes!" "You just made the last mistake of your life!" Losing sight of an enemy "Oh come now, resorting to petty tricks are we?" Defeating an enemy "I think they got the message." "Damn, just as I was getting warmed up." "I hardly felt a thing." "And that's why I'm the best." "That's what happens when you cross the Guild." "Look, before I have you help track Mercer down I need to know what you learned from Karliah. I mean everything." "Mercer killed Gallus, not Karliah."" "Aye. I feared that was the case. From that last entry in Gallus's diary, it looks like he was getting close to exposing Mercer to the Guild. Anything else?" "Gallus, Karliah and Mercer were Nightingales"
"What? Nightingales? But, I always assumed they were just a tale...a way to keep the young footpads in line. Was there anything else she told you?" "Karliah was behind Goldenglow and Honningbrew"
"Trying to make Mercer look bad in front of Maven, eh? Clever lass. Was there anything else?" "Then I have an important task for you. I need you to break into Mercer's home and search for anything that could tell us where he's gone." "He has a house in Riften?" "Aye. A gift from the Black-Briars after they kicked the previous family out...place called Riftweald Manor. He never stays there, just pays for the upkeep on it. Hired some lout by the name of Vald to guard the place." "Be careful, lad/lass. This is the last place in Skyrim I'd ever want to send you. Just find a way in, get the information and leave. And you have permission to kill anyone that stands in your way." "What's the best way to get into Riftweald Manor?" "Good question. I've only set foot inside a few times myself and that was in Mercer's company. If you can get past his trained watchdog, I think your best bet might be the ramp to the second floor balcony in his backyard. " "I don't suppose the ramp is easy to access." "No. It's some sort of crazy contraption Mercer commissioned for quick escapes. I'd wager a well-placed shot at the ramp's mechanism would lower it in a hurry." "What's missing from the vault?" "Better question would be "what did he leave." Mercer took everything. Even all of our plans are gone." "Plans for what?" "Before Mercer took over, Gallus started collecting every bit of material he could on locations the Guild could heist. Museums, keeps, estates...you name it. By the time Mercer took over the Guild we must have had a few dozen." "How could he have opened the vault door alone?" "I don't have a clue. That door is impenetrable. Without two keys, it's impossible to open. I have a key, Delvin has a key, and Mercer has a key. That's it. There are no other copies." "You mentioned a watchdog?" "That'd be Vald. A real piece of work, that one. Mercer's holding something over his head, keeping him loyal. Talk to Vex. She used to know him very well... if you catch my meaning." "We've scoured the town and I've spoken to every contact we have left. No sign of Mercer. Any luck on your end?" "He wasn't there, but I found these plans." "Shor's beard! He's going after the Eyes of the Falmer? That was Gallus's pet project. If he gets his hands on them, you can be certain he'll be gone for good and set up for life." "Then we have to stop him." "Agreed. He's taken everything the Guild has left, and to go after one of the last greatest heists is just an insult. I've spoken to Karliah, and made amends for how the Guild's treated her. Now she wishes to speak with both of us. Quickly, we have no time to lose." From here, the Trinity Restored quest will begin. If you have reached stage 25 of Promises to Keep, you can talk to Brynjolf to hear his opinion. However, it doesn't influence the quest. Prior to beginning any Thieves Guild missions, Brynjolf is totally invincible when outside in Riften. In fact, the game treats him as a ghost. He takes no damage, regardless of the source, and cannot be staggered or knocked back. Nevertheless, attacking him will cause him to become hostile. He is voiced by Robin Atkin Downes. There is a rumor that he is having an affair with Tonilia. Bryjolf also apears in Legends, as a questgiver and card introduced in the Heroes of Skyrim card expansion. Upon completing the Thieves Guild questline, Brynjolf will constantly repeat the same line of dialogue, and will no longer be open for interaction. 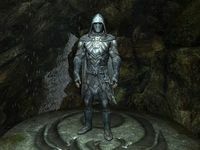 Before you enter the Twilight Sepulcher in the Thieves Guild questline, if you don't follow Karliah into the cave; Byrnjolf will follow you anywhere you go in Skyrim. Effectively he's a free companion and a powerful one too! ? This page was last modified on 23 March 2019, at 14:57.